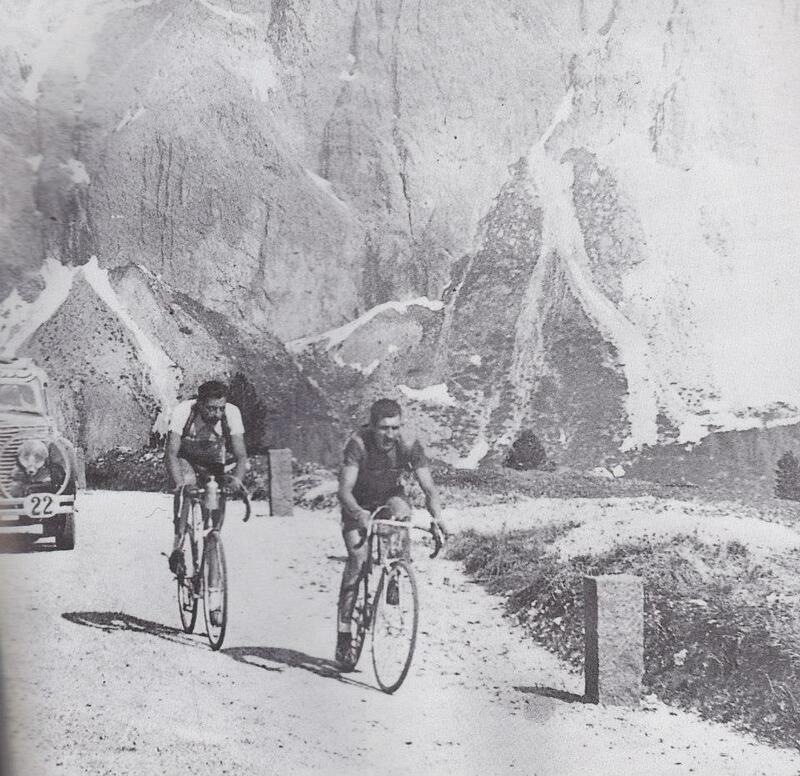 In the 1940 Giro d'Italia, Coppi's crisis took place when Giro reached the Dolomites on stage sixteen. There Coppi had apparently stuffed himself with chicken-salad sandwiches before the start of the stage and when the road started to tilt skyward, both Vicini and the chicken sandwiches attacked. Coppi started to have stomach problems. Whether it was nerves or food poisoning in an era before universal refrigeration, Coppi was in crisis. By the time they confronted the second mountain pass, his stomach could take it no more. He had to get off his bike to vomit, forcing him to watch the pack and the follow cars leave him behind. Bartali had been chasing the peloton after flatting and came across the miserable Coppi, who was still stopped by the side of the road. He started rescuing his teammate with a pep talk, telling him that the race could still be won. He gave Coppi some of his own water, talked him into getting back on his bike and got him riding back into the race. Vicini won the stage and Mollo followed in just shy of three minutes later. But with Bartali's help Coppi had saved his lead, finishing only four seconds behind Mollo. Bartali was a further three minutes back, but his vital work as ad hoc coach and soigneur had been done.The pink jersey was saved.